In this great video Jamie from the UK invites you to do it 'the Dutch way': go cycling in the Netherlands. We are glad to welcome you. The Netherlands has a reputation of being a great cycling destination. Nowhere else is cycling this established. There are even more bicycles than people here! The infrastructure is geared to cyclists: many roads have separate, dedicated cycle lanes for exclusive use by cyclists. Cyclists also have their own crossings and their own traffic lights. Cycle paths allow you to reach places you simply can’t get to by car. In the city, it is sensible to cycle behind each other. Outside the city, it is perfectly fine for two cyclists to cycle next to each other. You can read the personal observations of an UK cyclist here or watch the video of Jamie. Cycling in a city like Amsterdam is hectic, particularly at first. You have to contend with cars, trams, busy junctions with cyclists regularly jumping red lights. Don’t copy them; it is illegal and foolish. The impression you get of cycling in the big city is not representative of what cycling in the Netherlands is really like: outside the city, it is a peaceful, rural and well-organised experience. By the way, Dutch people always lock their bikes; in the city preferably with a chain lock to a fixed object (cycle stand, lamp post). It deters bicycle thieves from stealing the bike. See also cycle parking. There are different types of cycle route signs. Signs with red lettering against a white background point out the shortest cycling distance to places in the area. In nature reserves, this is mostly indicated by Royal Dutch Touring Club ANWB ‘toadstools’: square, low signs in the shape of a toadstool. When you follow recreational cycle route signs, you will not be taking the shortest route but rather the most scenic route to your destination. 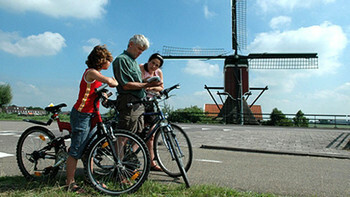 The intricate junction routes are intended for short trips from junction to junction, the long-distance national cycle routes or LF routes (Landelijke Fietsroutes) for longer bike rides and cycling holidays. In addition, you will see hexagonal signs for themed routes or special signs, of the local tourist information office, for instance. 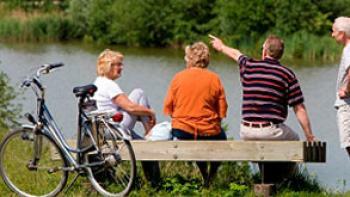 Anyone in good general health can get on a bike in the Netherlands. You won’t need a 21 speed hybrid in this flat country. A 3 speed bike will do you just fine. Mountain bikes are mostly used on rough terrain while racing bikes are suitable for cycling on asphalt (thin tyres!). Helmets are not compulsory here. Racing cyclists, mountain bikers and children who wear helmets do so of their own (or their parents’) choice. The Netherlands has a mild maritime climate. Precipitation occurs on average 7% of the time, spread over the year, including nights. So even though the ‘wet climate’ isn’t too much of a problem, make sure to always carry rainwear. The best time for cycling is from May to September inclusive. Hilly places have the highest rainfall because the clouds tend to hang over these places (Zuid-Limburg, Veluwe, on the coast by the dunes). In open landscape (polders, by the water), it can get pretty gusty. Check the weather forecast before setting out and plan your trip accordingly so you enjoy a tailwind instead of having to battle a headwind.